Pastel pinks, blues and lavenders converge to create metallic multidemension. Have you ever held a CD up to sunlight? The chrome-like side (not the side with that orange and brown striped pattern, if you're holding up NYSNC's "No Strings Attached") refracts the the sunbeams, throwing the prettiest blues, greens, pinks and yellows. Lucky for us, a few skilled hairstylists have found a way to bottle these hues. Meet hologram hair. It's the cute alien kid sister of geode hair and it's making its mom, glow-in-the-dark hair, proud. Colorists bring hair to a blonde base (yep, this one requires some bleaching), before introducing bright blues, baby pinks and soft lavenders into the mix. The trend is pretty ubiquitous on Instagram and Pinterest (we can see why!) and is frequently referred to as "opal" hair. Sure, we see the resemblance, but we're sticking with the CD analogy. Especially since holographic everything — nails and eye makeup, included — is having a futuristic moment. 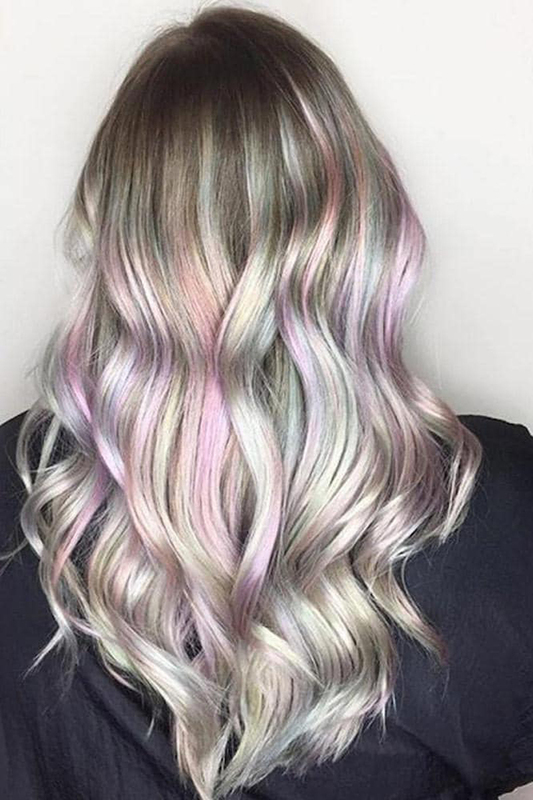 Much like other rainbow-inspired hair colors, holographic hair is what you make it. Opt for subtler, more blended colors, and let that shiny platinum base do the talking. Not a fan of yellow? Skip it! If you're feeling a little beyond our atmosphere, amp up the intensity and the chunkiness of the colored sections. While the trend is, no doubt, a bold one, you do have some control. But hey, with an intergalactic trend like this one, letting your colorist have a bit of fun might not be such a bad idea.